Earn up to 4,895 reward points. The NSPIRE range is the fruits of four years worth of labor at KHS. But how does it work? Well, NFUZD technology allows their pads to be easily fitted over the top of any drum, which means you won't need to remove heads and hoops to install them. This also means that you'll be using full-sized pads. KHS has joined up with software firm FXpansion, resulting in the NFUZD range being shipped with a specially tailored copy of drum sampling program BFD. This means that users will have thousands of kits at their fingertips right out of the box. In fact, you will have more than 55GB of 24-bit samples to choose from. The sound module features 16-bit/44.1 KHz on-board samples which produce Advanced Drum Emulation. The range has been developed along with the expert help of session star Russ Miller and e-drum guru John Emrich and promises full stereo WAV samples with full frequency response. 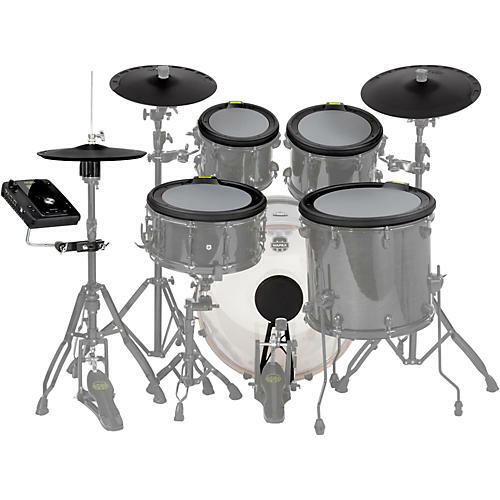 The bass drum samples sustain a wider frequency response throughout the length of the note compared to typical electronic kits, resulting in a fuller sound and more power. Cymbal sounds also feature full sounds instead of a short sample with loop points and a false fade resulting in a smoother and more realistic sound. The pads themselves are multi-zone products. So, taking the snare as an example, you can trigger a fat snare sound, a rimshot and a cross stick. Cymbals, meanwhile, are able to be choked. The Rock Full Pack features 10", 12", 16" toms, a 14" snare, hats, ride and crashes.